Kitchen knives are one of the most vital tools in the kitchen. They come in different types as well as to support the cutting needs of the food you’ll be cooking. However, what makes it challenging and interesting is the difficulty of choosing the right one. You may randomly choose a knife that looks trustworthy, but if you are keen on its performance, you won’t settle for just that. To make sure you fulfill your desires, we will discuss in this article the essential to consider when buying a kitchen knife. This will help your search in choosing the perfect one on the market. Not only that, we will also present here the top 7 best kitchen knives of 2018 so you will know which one should be on your checklist! 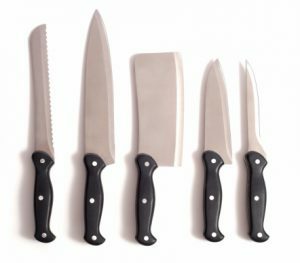 Kitchen knives are an everyday tool we use in the kitchen, which is why it is important to know the essentials of what to look for when buying one. Below are helpful considerations that will make your search for the best kitchen knife much easier. In terms of shape and size, kitchen knives have a wide variety. To choose the right shape, you must contemplate what types of food you usually cut in your kitchen. Blade sizes are also a factor that affects your selection. In line with this, the following shape types will be discussed individually to give you a good understanding of each type. This type of kitchen knife is said to be your everyday friend in the kitchen because it can satisfyingly cut vegetables, meat, and fish. Its blade has a rounded cutting edge with the tip facing the blade. It is recommended for beginners who are still exploring the kitchen workaround. The chef knife looks exactly like a sword, a shorter version though. 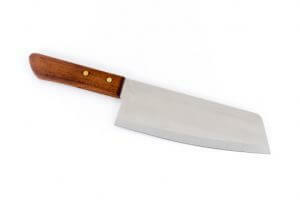 It’s called a “chef knife” because it is commonly used in Western cuisine. 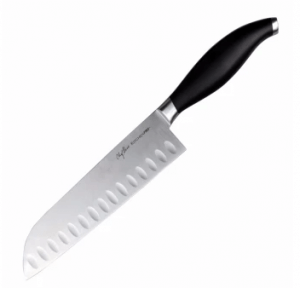 Its longer compared to the santoku knife, with a blade length of around 24-40 cm. This type was originally created for cutting meat, but it can also cleanly cut other foods. It’s one of the types for everyday use as well. Petti knife is known to be small and slim. Its blade only measures around 10 cm long. This type is suitable for cutting spices and other small ingredients. It’s also a suggested type for people who usually cook small amounts of food at home. The knife is great for peeling too because you can easily move it without the high risk of accidentally cutting your fingers. This type stands out among the other types because of its square-like appearance. It is primarily designed for cutting and peeling vegetables. This is a great recommendation for vegetarians out there. 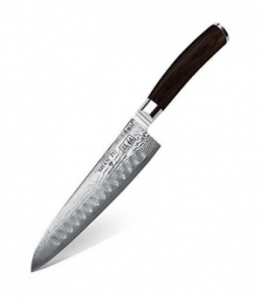 Generally speaking, there are two common material types of kitchen knives – stainless steel and steel. To know more about the differences between the two, please read the following carefully. The stainless steel material is known to bring ease of use in the kitchen. This material is durable and does not easily rust even if you always wet it. It looks shiny than steel because of the chemical element: molybdenum. In terms of sharpness, it would still depend on the manufacturer. Stainless steel kitchen knives with cheap prices tend to become dull quickly or not as sharp to start with. On the other hand, those with high prices have a higher possibility of assuring great sharpness, although not all the time. Just make sure you examine the product carefully. 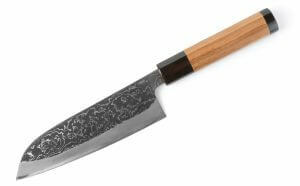 Steel was the first material used for kitchen knives. It’s known for its hardness and reasonable weight that assure excellent sharpness without exerting too much force when cutting. If it becomes dull, you can simply grind it with a stone to restore its original sharpness. This material is more traditional than stainless steel. Like stainless steel, it has also resistance to rust, unless left without proper maintenance. You just need to do your part of washing it immediately after use and letting it dry quickly too. Although the priority of kitchen knives is its blade, the handle also matters for grip convenience. Materials like wood and plastic generally compose the handle, and these materials give comfort when held. The only disadvantage with plastic and wood is they easily accumulate dirt, so proper sanitation should be done regularly. Metallic ones, on the other hand, are promising because they are usually molded to the blade. They also look stylish and easy to clean. However, when it reacts to cold temperature, you’ll feel the knife itself conducting it. It’s also slippery when wet, so you need to be extra careful. 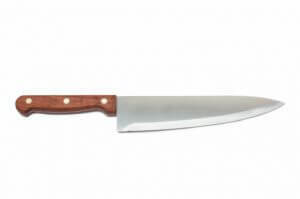 Now, we will introduce the top 7 best kitchen knives you can buy online. It’s a perfect list that you may consider when you start searching for the right kitchen knife. Chef Gene Gonzalez introduces a design that assures a sharp cutting edge. It’s great for vegetarians at home. 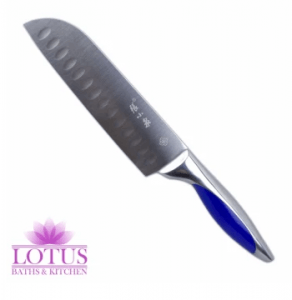 This Santoku knife is made of stainless steel with carbon, which makes it very durable. Its enhanced bolster offers excellent balance and control in each use. With its ergonomic handle, you’ll definitely get a good and comfortable grip. Although it can be a bit heavy, the weight does much of the work, so you’ll only need less force when cutting. It’s surely a cutting-edge knife that you should not miss! The ultra-sharp kitchen knife lets you experience a precise control for quicker slicing, cutting, and chopping. It’s awesome for commercial chefs, cooking lovers, and culinary students. Its ultra-sharp blade is made of pure stainless steel, designed to give you a lean and clean cut and is made durable that maintains its sharpness. The knife is also dishwasher-safe that effectively resists chlorine bleach too. You won’t get tired of continuously using it as well because it’s very light and handy. With its beautiful and elegant look, you’ll definitely add this to your collection in your kitchen! Your soft foods will for sure be presented in great shape with this Damascus knife because it guarantees the highest end performance. It’s incredible for people on a diet with meat and veggies as their main diet food. With its high-quality sharp blade, it gives you a fine and clean cut all the time. The blade is made of a combination of VG10 steel and Damascus steel that makes it really hard and can resist rust. Its natural steel pattern makes it a healthy design because it can be easily cleaned, which effectively reduces bacterial production. The handle is perfectly made from an elegant American pakka wood for a comfortable grip without hurting your hand. It’s a knife that flawlessly matches your diet! Although it’s not your typical-shaped knife, this serrated knife presents a worthy competition on the market with its exceptional performance. Its blade is made of a mixture of stainless steel and carbon for an outstanding durability. Its overall weight is also worry-free because it mostly does the work without you exerting much effort. With its enhanced support, you’ll achieve great control and balance while cutting. 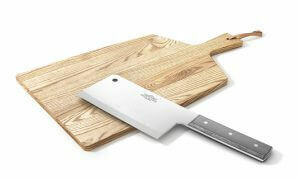 Its well-designed handle provides a better grip when you do your slicing and chopping. It’s a knife that deserves your attention! This kitchen knife is designed long that makes sure you get a professional, precise, and sharp slicing. It’s splendid for professional cooking enthusiasts, commercial chefs, and cooking moms. The knife’s blade is 8 inches long so that it can potentially cut long ingredients in one attempt. Its main material is stainless steel that makes it strong and sharp for long years of use. It’s also dishwasher-safe and corrosion-resistant that prevent any damage. 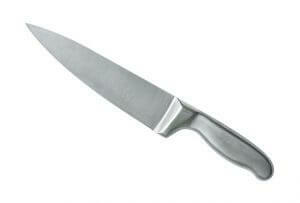 This is a knife you will always keep in your kitchen! This wonderfully made kitchen knife can easily cut your ingredients thoroughly without you getting tired. It’s recommended for commercial chefs and cooking dads and moms at home. This slicing knife is made of stainless steel mixed with carbon for a promising durability. You won’t be bothered by its weight too because it perfectly works with only less force. It also offers excellent balance and control for a better slicing. Its finely polished handle promises convenience and comfort when holding it. It’s a slicing knife that will not fail you! Kitchen knives can be your best friend in the kitchen if you choose the one wisely. As long as you keep in mind the essentials of how to buy a kitchen knife, you’ll definitely find not just the best but the one destined for you!